In case you’ve been under a rock all day, the show got renewed. We begin with Dean getting tossed around a shop by a giant, possessed … uh … green dinosaur. Really. We know it’s possessed by something because its eyes keep glowing. Sam jumps into the fray and tackles the dino. As Sam pins it down, Dean pours holy oil on it, then yells at Sam to get out of the way as he tosses a lighter on it. The dinosaur thrashes around, burning, then explodes into a shower of green and white confetti. Just in case you were expecting this to be a serious episode. As the Brothers get their breath back, the shopkeeper (named Alan) stands up from behind his counter and asks if it’s over. Sam says yes and apologizes for the mess, but Alan heads him off at the guilt pass. Alan: You guys just took down an evil plushie that was trying to kill me. We’re all good! Another guy comes in, whom Alan introduces as owning most of the real estate in the general area. The guy is suspicious of the Brothers, but this doesn’t stop Dean from taking Alan up on his offer to give them anything in his store. Dean chooses a large screen color TV, around which he creates a “Dean cave” back at the Bunker, while Sam tries to research how and by what an evil stuff dinosaur could have been possessed. When Dean shows Sam the Dean Cave, Sam asks how Dean found the time to organize the room. Dean tells him that you just make time, which probably translates to Dean being totally sleepless and wired on something. But let’s not go down that rabbit hole. … and reappear inside a cartoon. After an initial mutual freak-out, Sam starts to dither a bit more on his own that maybe it’s a dream. Dean slaps him (leaving a literal, if temporary, handprint) and tells him to focus. Sam’s still stuck on whether they’re inside the TV or what. Dean says that maybe it’s an angel thing, or the Trickster. Dean: Or … is he? They soon arrive at a malt shop, which Sam is rather sarcastic about. Dean says they should just pull in, go inside, ask some questions, and get their bearings. But then they see a shocking sight. The Mystery Machine is parked outside. They are inside a Scooby-Doo cartoon. [sigh] We’re gonna get a cartoon spin-off now, aren’t we? Dean: Just think about it – we do the same thing. We go to spooky places. We solve mysteries. We fight ghosts. When Sam points out that their ghosts are real and dangerous, and they don’t have a talking dog, Dean compares Castiel to one. So, the Brothers introduce themselves to the Scooby Gang and try to get through to them that they’re famous. The Scooby Gang respond rather blankly to this, especially Daphne, who acts like a total airhead when Dean hits on her relentlessly right in front of Fred. Actually (spoiler alert), Daphne acts like a total airhead the entire episode and Dean hits on her relentlessly the whole time, and I can’t say I’m wowed by that dynamic at all, even if Dean is up front about his contempt for Fred. So, the Scoobies are on a case. It seems Scooby-Doo just inherited a fortune from a mysterious Southern colonel (even in a cartoon episode, we just can’t escape the suckage that is Asmodeus). He saved the guy from drowning, but now the Colonel is dead and they’re off to visit his creepy old house. The Scooby Gang senses a mystery. When Sam grumbles a bit too loudly about this, Dean pulls him aside for a much-needed attitude-adjustment chat. Sam complains that the cartoon world they’re in is so shallow that there isn’t even any print in the newspaper article about the Colonel’s death. Dean reminds him that the last time they ended up inside a TV (“Changing Channels”), they had to play along until they could get back out. So, he’s playing along. Sam reluctantly comes with as Dean easily weasels his way into riding with the Scoobies. But not before some road food involving Shaggy, Scooby – and Dean – eating their signature absolutely enormous sandwiches. Reportedly, this was Jensen Ackles’ favorite bit to voice in the episode. Outside, Dean challenges Fred to a drag race, which (alas) the Mystery Machine easily wins when Fred beats Dean on the draw. Sam asks Dean why he hates Fred so much and Dean’s response boils down to “He’s perfect.” Oh, Dean. Sam: Let it go, dude. Dean [after a moment of apparent defeat]: NO. At the creepy old mansion, Dean realizes they’re in the episode, “A Night of Fright Is No Delight.” This is a real episode, btw, from season one. At the reading of the will (which is on a vinyl record), the Colonel tells his various heirs that each one will inherit a million dollars, but only if they can stay the night at his mansion. If any of them leaves, their share will go to the others who don’t. There’s one catch – the house is haunted. The startles Sam and frightens Scooby. Sam complains that the conditions are ridiculous and can’t possibly be legal, causing Velma to tell him that ghosts don’t exist and these kinds of situations happen all the time. Sam starts to blurt out that sure, they happen inside a cartoon, but Dean stops him. Dean tells Sam that the Scooby Gang are “pure and good,” and the Brothers aren’t going to blow that for them by messing with their minds by telling them they’re inside a cartoon. Sam grumbles that Dean just wants to get with Daphne. He has a point (Dean’s obsession with Daphne is pretty messed up), but so does Dean. There really isn’t any positive or beneficial point to destroying the Scooby Gang’s sense of their own reality, any more than Sam and Dean can just skip to the end of the story. After all the fantasy worlds they’ve been in, Sam should know that by now, but maybe Dean’s just more of a veteran of this multiple-worlds deal. The lawyer, Cosgood, tells them he’ll be back in the morning and leaves with a creepy laugh. Dean tells Sam Cosgood is the bad guy of the episode. Sam rolls his eyes. If they watched Scooby-Doo their entire childhoods, shouldn’t Sam have a good chance of remembering this episode, too? Anyhoo, one of the side characters (an heir) suggests they all turn in at 10pm, which gives Dean the chance to creep on Daphne some more. Sadly, she notes that “girls and boys don’t sleep together” and goes off to sleep with Velma. In the same bed. Oh, the possibilities. But since it’s written by two straight guys who totally didn’t see the #Metoo movement coming, that doesn’t go anywhere. Dean and Sam have to sleep in the same room as Fred and Scooby (not sure where Shaggy is). As usual, Dean finds perks to their current situation. He loves wearing a nightshirt. Sam is in pajamas. So is Fred. Meanwhile, the girls are talking about the Brothers. Daphne likes them and Velma thinks Dean is okay, but thinks Sam is an idiot for believing in ghosts. Daphne calls her on this, pointing out that Sam is just Velma’s type, and Velma blushes. Meanwhile, what looks like a ghost is roaming the halls, cackling. One of the heirs is brushing his teeth when the lights flicker and his breath fogs up. He turns around to see the ghost, which goes after him with a knife while flaring pink light. Meanwhile, Sam is complaining about Dean eating another sandwich while the others sleep. Dean uses his knowledge of the episode to note that in a minute or so, someone will go missing and “the Scoobies are gonna think that it’s a ghost. But really, it’s the lawyer, Cosgood Creeps, in disguise.” At that moment, they hear a scream. “Toldja,” Dean says. Everyone runs toward the room from which emit the screams (note: The animation for this episode is better than the rather bare-bones animation of the original; Hanna-Barbera wasn’t known for sparing no expense). Inside the heir’s room, Daphne finds a body soaked in blood. Dean is confused, saying the “dummy bodies don’t show up until later,” but when Sam pulls off the blanket, the heir is really dead, stabbed to death. The Scooby Gang is shocked. Fred utters the classic Scooby phrase: “Well, gang, it looks like we got another mystery on our hands.” The Brothers are flabbergasted at how cold-blooded the Scooby Gang is about the murder, as the Scoobies stroll off to look for clues, utterly unconcerned by what they’ve just seen. In the drawing room, Shaggy and Scooby are frightened by the possibility that ghosts really exist, while Fred and Velma pooh-pooh the idea. But as Velma is taking a page from Sherlock Holmes, a creepy figure creeps past the window behind her. The Brothers get into position to ambush it as it opens the window, but Fred grabs it first, throwing it to the ground wrapped in a curtain. When Dean yanks off the curtain, it’s … Castiel. Startled, the Brothers help him up and Dean introduces him to the Scooby-Gang. 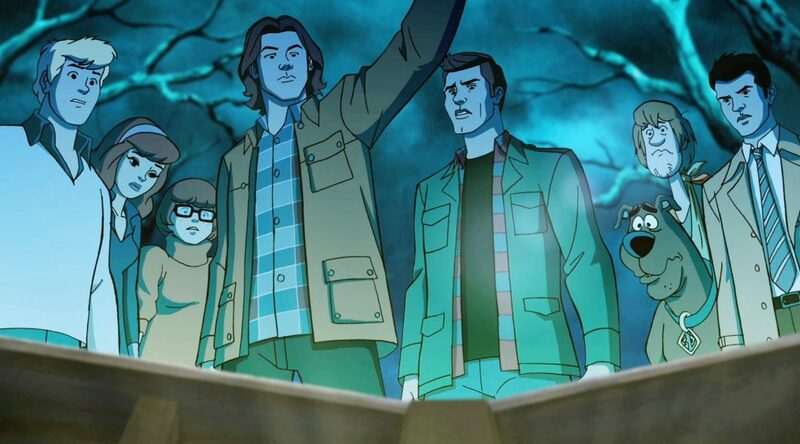 Shaggy and Scooby come right up to welcome him, prompting Castiel to note that Scooby talks. Apparently, the show writers forgot that Castiel can talk to animals and doesn’t find it strange in the least. Dean asks Castiel how he got into the cartoon. There’s a flashback of Castiel returning from Syria with “fruit from the tree of life.” He recounts an amusing tale of killing most of the djinn who were guarding it, before striking up a bargain with the survivors and accidentally marrying their queen. He entered the room where the cursed TV was, saw the Brothers starting their drag race with the Mystery Machine, saw pink and purple sparks, and was dragged into the cartoon. There’s previously been a creepy figure as the Impala roared away in the drag race. It turns out that was Castiel. As the Brothers bring Castiel up to speed, Velma listens in, then mocks Sam for his belief in ghosts. Gotta say that even for simplistic cartoon characters, the Scooby Gang are annoyingly broad here, with the exception of Shaggy and Scooby, who are criminally underused so far. The voicework for them is great, though. Suddenly, there’s a distant roar, the lights flicker, and the room turns cold, scaring Shaggy and Scooby. Cue a montage of lit lamps and flashlights, and ghost hands on window glass, as everyone investigates. The Brothers hear a side character getting sliced and diced inside a room, and investigate. But all the doors in the very long hallway slam shut and when Sam reaches for a doorknob, a ghostly hand slaps his flashlight aside. Then the ghost makes its appearance. Shaggy and Scooby jump into each other’s and then Castiel’s arms. Fred tackles the ghost twice, which doesn’t help when the ghost disappears into the wall. The Brothers duck. There’s some discussion from Velma about how this couldn’t possibly be a ghost, then they all open the door to the room and find a side character ripped apart inside, with half of him tied to the ceiling. Dean nearly throws up. The Scooby Gang walks off, totally unfazed. Sam asks Dean if the Scooby Gang is always this cold-blooded about dead bodies, but Dean is more concerned about the obvious signs of a real haunting. He thinks the cartoon itself is haunted. They compromise on Dean going with Daphne (and, unwillingly, Fred), Velma off with Sam, and Castiel guarding Shaggy and Scooby. Up in the attic, Velma both insults and hits on Sam something heavy. Sam tries to give her The Talk, but Velma will have none of it, not even when they find a chest of possessed toys, covered with ectoplasm, that attack them and drive them out of the attic. Anyhoo, in the library, Dean is hitting on Daphne again and asking her what she likes in a man. She says the usual and then adds “an ascot,” which leaves Dean rather taken aback. Not lovin’ this subplot at all, but I do like when Dean notices a book standing out from the bookshelf (all the other books are painted on the background) and calls this to the attention of Daphne and Fred, who are dismissive about it, at least until a trapdoor appears underneath them and throws them down a long, twisty shaft to a cellar. There, in the dark, Dean thinks he’s talking to Daphne, but it turns out to be the ghost, who chases them. But then, the ghost is also stalking Scooby, Shaggy and Castiel upstairs. And while I don’t mind at all that Castiel is in this story, why have Scooby and Shaggy been relegated to comic relief with Castiel when Scooby’s the actual star of the show? Why all the focus on Fred, Daphne and Velma, who are boring twits because they are the straight-man supporting characters? There’s not enough Scooby and Shaggy in this episode. Scooby and Shaggy are frightened by the ghost and run from him. Castiel isn’t, at first, but when Scooby and Shaggy grab him, he’s suddenly telling them to run (cartoon logic, I tell ya). Cue the classic Scooby-Doo theme song (finally), which involves lots of the old running-around gag (Scrappy-Doo even pops up during a run down the hallway through different doors, though the gag is mercifully brief), and Dean alternately protecting and hitting on a clueless Daphne. Think she’s more in danger from him than from the ghost, though she’s kinda into it toward the end of the montage. The song ends with their boarding up all the doors and tumbling back into the drawing room. But the ghost busts through and tosses the Scooby Gang all over the place. Poor Shaggy even gets defenestrated, though Scooby goes after him and Castiel saves them both. Sam grabs some iron candlesticks, and he and Dean drive off the ghost. Fred gets a bloody nose and Shaggy breaks his arm, which shocks the Scoobies to no end. Sam’s suggestion to Dean that they give the Scoobies The Talk backfires as the Scoobies totally freak out and turn on each other (Shaggy is especially bitter). Dean is forced to give them a rousing pep talk about how they are “heroes” and have beaten many a bad guy before. They can do this. They’re game, but Velma points out that the Scoobies know nothing about real ghosts. Sam says that’s okay. And he and Dean show them the Impala’s trunk. Dean is a little horrified, saying giving salt guns and other such weapons to the Scoobies is a “Scooby-don’t.” But Fred finally wins Dean’s admiration when he says that “we have to do something” and that they can help. Cue Fred setting an elaborate, Goldbergian trap in the drawing room. The trap doesn’t quite work as planned. When Scooby, Shaggy and Castiel act as bait, they get the ghost after them, but accidentally get stuck in the trap. But Dean has a Plan B (“Fred’s plans never work”), which involves the ghost chasing the other Scoobies before being distracted by a book-pelting Scooby, who weighs the ghost down with some books and sends it down the trap door. The ghost finds itself trapped inside a line of salt (there’s a neat effect of the barrier as it thrashes around inside it that the show usually can’t afford to do). After the Brothers and Castiel inform it that it’s trapped, it finally reveals its true form and identity. It’s a little boy. His soul was attached to a pocketknife, which the creepy neighbor guy of the pawn shop owner got hold of. The guy has been using it to force everyone in the area to sell their shops to him for cheap. That’s why he owns almost everything there. It’s why he compelled the ghost to attack Alan, the pawn shop owner, with the green Barney dinosaur plushie. The ghost is happy to send them back to the real world after they promise to release it once they get there. But first, Dean asks a favor of it. The Scooby Gang is totally freaked out, so the ghost pretends to be Cosgood and the Scooby Gang reveal him. Castiel heals Shaggy on the sly, Velma acts all smug and then kisses Sam, and Dean says a goodbye to Daphne that she promptly forgets as she runs after Fred and the others leave. Then the ghost reappears, and the Brothers and Castiel are sent back to the real world. At this point, even Sam is willing to admit that they just had a “cool” experience. Dean agrees, though much more enthusiastically, but quickly gets back down to business. He goes out and returns with a blowtorch and a sledgehammer. Smashing the TV, he finds the pocketknife. The little boy ghost reappears and asks if he will be with his beloved father now. The Brothers are gentle with him as Sam torches the pocketknife. The little boy’s ghost disappears in a puff of white light and smoke up to Heaven. At the shop, Alan is about to sign away his business to Creepy Real Estate Guy (Jay). Fortunately, the Brothers show up with Castiel, Dean wearing an ascot. Sam and Castiel lay out the plan – he used the ghost to scare off all the local business people so he could buy up their property cheap. CREG tries to claim they can’t prove anything about a ghost. Sam agrees, which is why they hacked his accounts and found out he doesn’t pay his taxes. Castiel: Dean, you’re not a talking dog. Credits are in a different font this week and there’s a new theme song.